Spring is definitely in the air! Those of us who were bogged down by snow and bitter cold this winter are happily looking forward to sighting the first brave little flowers popping up through the still icy ground. Seasonal allergy sufferers, however, are not looking forward to the release of billions of tiny spring pollens that can bring on sneezing, coughing, congestion, sniffles, itchiness, breathing problems and other disagreeable symptoms. According to the American Academy of Allergy, Asthma and Immunology, pollen season can begin as early as February and last through October depending on what’s blooming where you reside. Seasonal allergic rhinitis, which affects 40 to 60 million Americans, occurs when the immune system becomes sensitized and overreacts to something in the environment, such as airborne mold spores and pollens from trees (spring), grasses (summer) and weeds (fall). Allergic reactions are annoying, but otherwise normal, immune responses to substances that are usually not harmful, including pollen, mold, pet dander and dust mites. In sensitive individuals, the immune system views allergens as invaders and responds by unleashing antibodies, histamines and other compounds, which leads to localized inflammation, irritation and discomfort. Although generally a temporary condition, allergy symptoms can be very unpleasant and can disrupt sleep and daily activities. 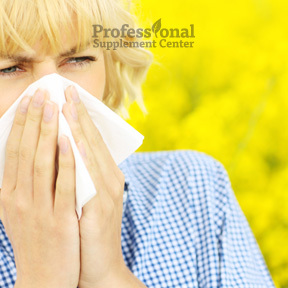 Allergic triggers differ for each person and once you know that you have spring allergies, it pays to be proactive. OTC therapies such as antihistamines, decongestants, eye drops, or nasal sprays should be initiated at least 2 weeks before the likely onset of symptoms. These medications will treat allergy symptoms but will not address the root cause. Inflammation, once developed, reduces the chances that these treatments will do much to alleviate the discomfort. Swollen tissues can block nasal passages and limit drainage from the sinuses, which can often result in a sinus infection. Try natural herbal remedies to relieve allergy induced symptoms. Quercetin, a bioflavonoid, acts as an antihistamine and an anti-inflammatory and aids in preventing histamine release. Capsaicin, found in chili peppers and cayenne, helps to reduce nasal congestion and stuffiness. Vitamin C is a natural antihistamine. Swiss clinical trials found the plant extract butterbur was as effective as OTC antihistamines in easing airway inflammation. Bromelain, a plant enzyme, is sometimes used to curb inflammation after sinus surgery to reduce swelling and improve breathing. NAC aids in thinning mucus, allowing for improved clearing of respiratory airways. A few drops of eucalyptus oil, which has anti-inflammatory and antibacterial properties, can be added to a bowl of steaming water to supercharge inhalation, aiding in opening sinus and nasal passages. Hot peppermint tea has both decongestant and expectorant properties. Replenishing your intestinal system with healthy microbiota through probiotic-rich foods or a probiotic supplement will aid in strengthening the immune system, especially when antibiotics are prescribed for a sinus or respiratory infection. Avoiding sugar laden foods and refined carbohydrates, which feed harmful microbiota, will help to support the immune system and protect against inflammation. An overall healthy and well balanced diet may be helpful in controlling or eliminating symptoms. Research suggests that certain foods may help fight allergies by controlling underlying inflammation or dilating air passages. Following an anti-inflammatory diet reduces overall swelling and fluid accumulation in tissues, which can assist in healing, detoxification and reduction of allergic symptoms. Irrigating daily with a saline nasal rinse to clean and clear nasal passages decreases sinus inflammation and rinses away pollen. This can be done at any time of year and is especially helpful before and during allergy season, as it aids in eliminating symptoms and helps to protect sinus membranes. Addressing stress, hormone imbalance and food sensitivities can also help to alleviate allergic reactions. High levels of stress can lead to imbalanced cortisol levels, which may negatively affect immune system function. Consider acupuncture as a proactive measure to correct underlying imbalances that allow symptoms to develop. Acupuncture may also help to reduce symptoms that have already flared. Ongoing treatment throughout the season may be necessary to keep symptoms under control. Yoga is a natural stress reducer. Stress promotes inflammation, which intensifies allergic responses. Yoga breathing techniques may also help to open stuffy or clogged nasal passages. As much as possible, limit your pollen exposure. Keep windows and doors closed and, if feasible, stay indoors between 5 a.m. to 10 a.m. when pollen counts are highest. Tracking pollen counts listed online or in your local newspaper can help you plan outdoor activities accordingly. Dry, sunny days will have higher pollen counts than colder, rainy days. Pollen can settle on your hair or clothing so wearing sunglasses and a wide-brimmed hat can help. Be sure to change clothes and shower before bed after spending time outdoors. Pets can also bring pollens indoors, so bathe them frequently and try to keep them out of your bed to reduce further exposure. As much as we might not want to take the time to do it, spring cleaning your home can help remove pollen that can come in through open doors or windows or can be brought indoors on your shoes and clothes. Installing a high efficiency particulate air (HEPA) filter in your vacuum or air conditioning unit also helps to remove microscopic irritants. Natural D-Hist by Ortho Molecular – This popular formula provides optimal seasonal allergy support with a targeted blend of anti-inflammatories, antioxidants, enzymes and botanicals, which actively promote healthy nasal and sinus passages for those with elevated histamine and respiratory irritation. Contains quercetin, stinging nettles, vitamin C, bromelain and NAC. Non-drowsy, gluten and soy free formula. D-Hist Jr children’s formula also available. HistaEze™ by Designs for Health – This synergistic blend of nutrients provides natural support to help balance the immune response during allergy season. With vitamin C, quercetin and nettles, this formula also supplies a patented and clinically researched Ayurvedic herb known for its immunomodulating ability. Gluten, soy and dairy free, non-GMO vegetarian formula. MucoStop™ by Enzymedica – This blend of proteolytic enzymes assists with seasonal allergies by reducing the effects of histamine-induced inflammation, supporting normal mucus function and promoting natural antihistamine qualities. Gluten, soy and dairy free, non-GMO vegan formula. MSM Powder by Pure Encapsulations – This highly pure and effective anti-inflammatory acts as an immunomodulator, supporting respiratory function by eliminating free radicals, detoxifying cells and flushing out allergens. Gluten and soy free, non-GMO vegetarian formula. This entry was posted in Home and tagged HistaEze™ by Designs for Health, MSM Powder by Pure Encapsulations, MucoStop™ by Enzymedica, Natural D-Hist by Ortho Molecular, Spring Allergy Season. Bookmark the permalink.